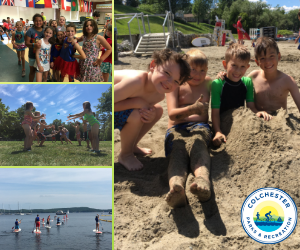 Colchester summer camps are jam-packed with activities, arts & crafts, beach time, and outdoor play at our beautiful park facilities. Campers will love spending time with their friends, swimming at Bayside Beach, attending enrichment activities, and so much more. Free lunch is also included with registration for most full-day camps! Full day options include: JRX Camp (ages 4 – entering Gr. 1), Explorer Camp (entering Gr. 2 – 3), or Xtreme Camp (entering Gr. 4 – 7). Camps are scheduled weekly throughout the summer, June 24 – August 16. Visit http://colchestervt.gov/recreation to view the full Activity Guide or to register online.